Krispy Kreme Doughnuts Inc. is spreading its glazed delicacies to a 10th country in Northeast Asia, opening 10 shops in Taiwan. The franchisee agreement with Huan Hsin Co. Ltd. requires the group to open the shops within five years. Huan Hsin focuses on the restaurant, food processing and importation sectors in China, Malaysia and Taiwan. It also has a presence in electronics manufacturing. 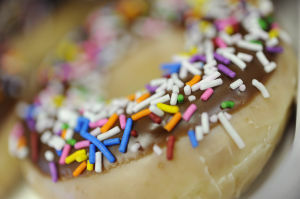 Jeff Welch, president of Krispy Kreme’s international division, said the company chose Huan Hsin because of its expertise in retail food in the Chinese and Taiwanese markets. In December, Krispy Kreme reached a symbolic threshold with the opening of its 500th international shop. It began selling doughnuts internationally in 2002.
International franchise sales represented 11 percent of Krispy Kreme’s revenue ($17.8 million) through the first three quarters of its fiscal year 2013. However, global expansion is a big part of its growth strategy. Counting the United States, Krispy Kreme has franchisee shops in 21 countries: Australia, Bahrain, Canada, China, Dominican Republic, Indonesia, Japan, Kuwait, Lebanon, Malaysia, Mexico, the Philippines, Qatar, Saudi Arabia, South Korea, Taiwan, Thailand, Turkey, United Arab Emirates and United Kingdom. The company also has a franchisee in Puerto Rico, a U.S. commonwealth. It signed franchisee agreements in 2012 to enter India, Russia and Singapore. It is also pursuing a franchisee in Brazil. “As a result of a strategic approach to international growth, we have commitments for nearly 400 additional international locations, so we are well on our way to meeting our corporate goal of 900 international stores by the end of fiscal 2017,” Clark said in December. In the past 20 months, Krispy Kreme has announced major expansions for the United Kingdom (35 planned new shops, for a total of 80), Japan (73 planned, to 94) and Mexico (58 planned, to 128), as well as entering the following countries, India (115 shops), Russia (40) and Singapore (15). Sean Williams, an analyst with The Motley Fool, said in October that international sales will become increasingly important to Krispy Kreme as it again approaches sales saturation within domestic markets. “Management can add new flavors, healthier options such as yogurt and more coffee styles, but they will not move the needle in terms of revenue,” he said. Williams said Krispy Kreme’s Asian expansion plans are similar to those of tobacco companies, with both trying to entice young middle-class consumers who have disposable income.